Fiero is a word coined by Italian Psychologist Isabella Poggi. It is a term which describes a unique emotion that is often seen after sporting events, but it's certainly not limited to athletic events alone. It is felt and seen after a difficult problem is overcome whether the obstacle is physical, emotional, intellectual, financial, etc. - and regardless of it's origin, once a significant problem is overcome and a great accomplishment is achieved, fiero is the name given to describe this emotion. It is interesting that although English has more total words than any other language, it doesn't have as many words which describe the different positive emotions as many other languages. It needs more. The word "Fiero" is Italian in origin. 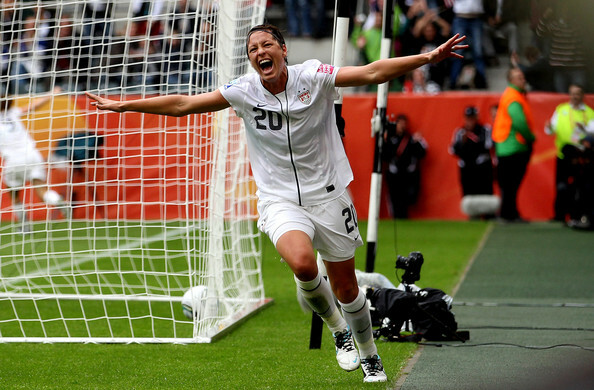 In this photo American football/soccer player, Abby Wambach, experiences fiero after scoring the go-ahead goal in the semi-final match against the France. The posture of arms up and moving rapidly, running wildly and jumping are highly typical of fiero. Ms. Wambach's' facial expression is also highly consistent - shouting, mouth open extra wide with teeth bared (including the bottom teeth) - interestingly similar to, but not identical to, extreme pain and anger - is demonstrated well after her team's victory. Note how her eyes are nearly closed as well. After a few seconds to a minute or so, just after the accomplishment is achieved, these very extreme facial expressions resembling pain and anger are replaced by classic emotional expressions of pure and extreme joy. 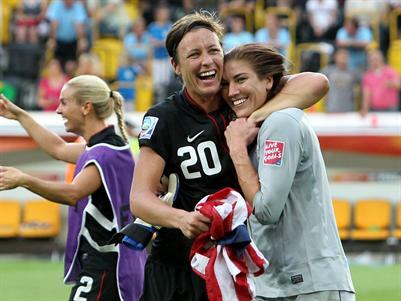 This is displayed well below where Ms. Wambach is sharing this with team-mate, Hope Solo. It is here in these post-fiero moments, where you will see some of the most sincere examples of smiles and happiness. Fiero does not need an audience. It is not braggadocio in nature. We all can recall moments when we felt fiero and we were alone - but like all positive emotions it is much more enjoyable when shared.